Las Vegas is one of America’s hottest pit stops for some good ole fashion adult entertainment. It’s also one of Phoenix’s most popular road trip destinations. Which got us thinking of a challenge… a one tank challenge? From our offices in downtown Phoenix to our penthouse suite at the Vdara Hotel in Las Vegas is roughly 300 miles one way. Doesn’t sound like much of a challenge; most modern cars can do 350 miles on a single tank. But what if we went from Phoenix to Las Vegas back to Phoenix? Things just got interesting… There was a running bet in our office that we wouldn’t make it. A very special car had to be chosen for this challenge and we thought the revamped 2014 Volkswagen Touareg TDI would be up for the task. On paper it has all the right ingredients; a 26 gallon fuel tank, 30mpg highway, and comfort for four passengers. Apply the math and we should get roughly 700 miles of road to travel… comfortably. But let’s save the challenge for later and talk about the car at hand – the 2014 Touareg. In our opinion Volkswagen has one of the more contemporary looking vehicles on the market. The overall styling may appear a bit lack-lustering but the art is going to be in the details. The Touareg is very sophisticated and held back from brash over dramatic styling. It has a certain business like curb appeal. It even gets a little bling from the LED daytime running headlamps that look like polished gems. The euro designed taillights also add a luminous effect. Illuminating the road head, the Touareg uses Bi-Xenon headlamps that give it the right kind of defiance. Add the 19” alloy wheels and you’ll be looking pretty sharp from behind the wheel. The same story goes for the interior; it’s full of professional structured wood accents and silver trim that works well with the leatherette dash. We did think the center console was a little overdone with the wood finishes for our liking. Our Touareg came with the Lux package that offered up Saddle Brown leather interior; and up against our Night Blue Metallic exterior paint made for an odd combination that we felt wasn’t very attractive. At least the interior was tremendously comfortable; with the help of the 12-way heated power adjustable front seats. Going for the Lux is like springing for darn near the whole package. The Lux is the middle range model that is full of standard equipment that would normally be an optional extra. The large touchscreen navigation is one of those interesting features. And when I say “interesting” I mean: the voice command didn’t work properly, entering a destination was quite difficult – especially on the move, and the vehicle locator icon kept falling off the road. Plus like any typical German Nav system the woman sounded like an old style computer generated voice from the 90’s. But that was easily forgiven with the dual-zone climate control that filled the cabin superbly and to add some extra natural light the full glass panoramic roof was a pleasant touch. With the road trip planned, I needed a passenger to keep me company on my long journey to Vegas. Somehow one turned into three tenacious women agreeing without hesitation to tag along for the ride. With that, the power lift tailgate was an excellent feature for the amount of times the trunk had to be opened and was large enough to fit two weeks’ worth of luggage for a weekend trip. Even though the back seat was full of passengers, the 40/60/40 seats can fold at a push of a button for additional cargo room. Now back to the challenge; before setting off on our “One Tank Challenge”, we had to stop for fuel; unfortunately the closest diesel gas station to our offices was a Circle K – not our first choice but will have to do. After topping off the tank, it left us with 675 miles on the trip computer. To help cover this long journey our Touareg had a 3.0L 240 horsepower TDI V6 that developed 406lb-ft of torque. That is quite an interesting combination of performance numbers but manage to work together at getting from 0 to 60mph in about 7 seconds. When setting off, it feels sluggish at first, but after hitting 2,500rpms the torque kicks in and can feel the acceleration grow. To help make things go smoothly and more efficiently the Touareg uses an 8-speed automatic transmission with sport mode that is fairly smooth through the gear changes and is excellent when left in “Drive” mode. Take it out of “Drive” and into “Manual” and the system simply becomes a headache and pain to use; it doesn’t respond well to the gear changes, there is hesitation between shifts, and will still shift automatically at 4,000rpms. You would never guess this was a diesel if you were standing next to it with its engine running. It definitely doesn’t sound like a farm truck. The Touareg is very quiet, even when you’re hard on the gas petal. Being inside the Touareg is very relaxing, at speeds upwards to 80mph there is no wind or road noise – making it almost a sanctuary. Until you go applying the brakes and you realize there isn’t enough stopping distance. That’s when the Touareg felt extremely heavy when trying to make an abrupt stop. On our long 13 hour road trip, the suspension maintained a smooth and comfortable ride for the long haul, even when the road conditions looked unbearable. When we got into the mountains and the roads became more entertaining, the Touareg felt right at home. It was then it felt like a German sports sedan. The steering was tight and precise in the corners. The fat tires helped maintain balance while the suspension system sustained even weight distribution thus allowing for minimum body roll into the corners. 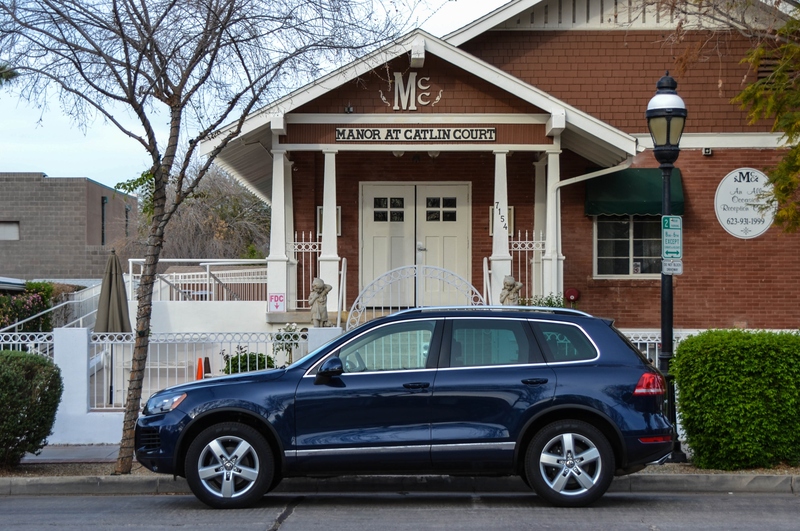 Over the course of the challenge the Touareg showed eagerness in achieving its sticker mpg of 30 – hitting just shy at 29.4, while averaging 19.6 in the city for a combination of 24mpg. After leaving Phoenix on a Friday afternoon at 1:00pm we made it to Las Vegas using just short of ½ a tank traveling 296 miles and still showing 355 miles left on tap. Everything was looking good for the return back. The original plan was to leave the Touareg in the Valet garage until our departure on Sunday but sadly that didn’t happen and we ended up traveling around the city like a tourist. When Sunday arrived and started to head back to Phoenix, only 240 miles was shown on the trip computer – not a very promising start. But this was a challenge, and we weren’t about to give up. So we trucked onwards. Somehow through our economical driving style we went from starting with 240 miles, a tick more than a ¼ tank, and bit of luck we made the 300 miles back to our starting point, the Circle K by our office with only 20 miles left on the ticker. Doing this challenge was about showing how excellent and efficient this diesel can be. This Touareg was phenomenal! The diesel engine – brilliant! The 8-speed transmission – fantastic (when left in “Drive”)! We were stunned at how amazing this SUV is and how far it can travel. What was more impressive is that we were loaded up with 4 adults, and their luggage. There are still some kinks that need to be worked out; that Navigation System, the brakes, and USB port would be nice – but at the end of the day it turned out to be one brilliant piece of machinery.